Lancaster at War: Santa Claus, 'we abhor you'! Looking at Lancaster's newspapers of December 1861, I get the impression that Christmas observations and celebrations were fairly modern in almost every regard. Basically, it involved a holiday centered around food, family, gift giving, and a special church service. I don't know how prevalent it was nationally compared to Lancaster County with its Pennsylvania German and German German traditions, but Christmas trees appear to have been common. Lewis Jones of Company H, 79th Pennsylvania, even took the time to erect a tree in camp and adorn it with hardtack and "speck" (slab bacon?). Lancaster merchants and Philadelphia department stores launched Christmas-focused marketing campaigns, and Lancasterians who could afford it made an event out of a Christmas shopping expedition to Philadelphia. The only thing missing, though, from an 1860s Christmas was Santa Claus' story, which was only then beginning to take shape. A full-text search of the Pennsylvania newspapers project gives only 130 entries, with 26 coming from the Mariettian, Columbia Spy, and Lancaster Intelligencer. The first mention appeared in the December 4, 1847, Spy in an advertisement for a candy store. 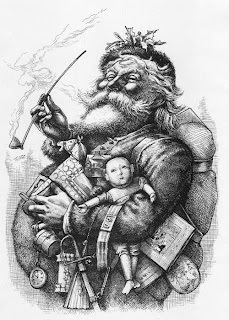 He pretty much disappeared for the 1850s, but returned in a humorous article, "Doesticks Sees Santa Claus," in the December 28, 1861, Spy that begins with the sentence, "I've seen him." It looks as if Santa Claus had fairly broad recognition by the 1860s, but it would require a lot more cultural momentum before he'd get to the point where he is today. Perhaps it would be accurate to say that he had more Easter Bunny status during the Civil War, although everyone seems to have known about the poem, "Twas the Night Before Christmas," judging by a parody that was printed and reprinted during the Civil War (which I'll post in the near future). Up next in a short series of posts about Christmas 1861: A dramatic story about a dangerous Christmas Eve crossing of the Susquehanna River set in Marietta in the 1830s.